The early church was made up almost exclusively of Jews. The earliest Christians were still learning that God’s Kingdom would include both Jews and Gentiles (non-Jews). God’s original promise to Abraham (Gen. 12) involved blessing all people through Abraham’s descendants. Jesus’ life and death made it possible for all people to become part of God’s family. The story of Peter and Cornelius (Acts 10) shows how Peter, a Jew and one of the first disciples of Jesus, would come to understand that the church would include Gentiles as well. It was an important step in the growth of the young church. 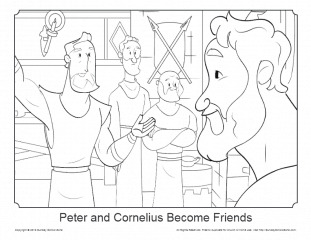 This Peter and Cornelius coloring page can be used to help kids learn this important story and discover that God sees all people the same regardless of race.